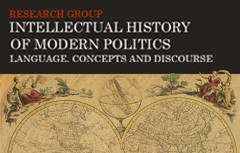 Javier Fernández Sebastián is Professor of History of Political Thought at the Universidad del País Vasco (Bilbao) and PI of the Research Group on Intellectual History of Modern Politics. He has been Fellow and Visiting Professor at various universities and research centres in Spain (U. Carlos III, UIA, etc. ), France (EHESS, U. Paris III), Germany (MaxPlanck Institut für Geschichte), Brazil (USP), the UK (University of Cambridge) and the USA (University of Harvard). Member of the editorial board of several Spanish and International Journals (Revista de Estudios Políticos, Historia Constitucional, Res Publica, Ariadna histórica, Mélanges de la Casa de Velázquez, Historia y Grafía, Almanack, Contributions to the History of Concepts. He coordinates a series of classical texts on political thought in the Basque Country (Textos Clásicos del Pensamiento Político y Social en el País Vasco), as well as the collection Social Sciences & Humanities (Mc Graw Hill- Santander University Press). Member of the Editorial Board of the series International Archives of the History of Ideas (Springer Verlag).